Regular readers will probably know that Lounger Tim Smithies, in addition to his skills with axes, fiery brands, paving slabs and nasal nails, plucks a mean string or several. 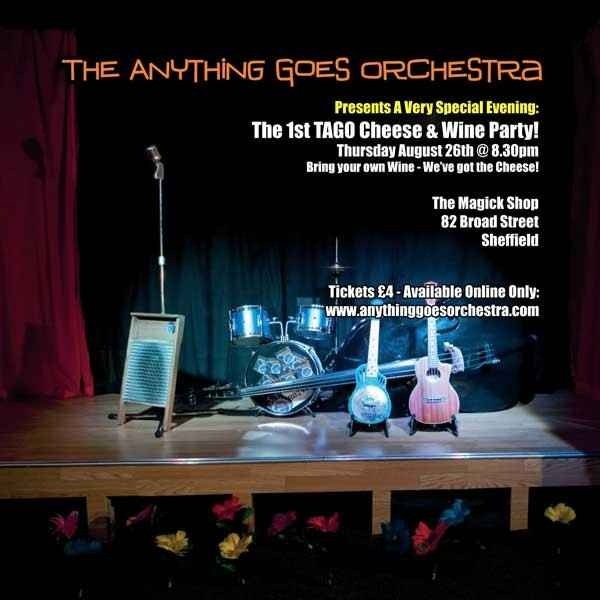 His band, The Anything Goes Orchestra, is fast making a name for itself in pubs, clubs and festivals far and indubitably wide. We’re delighted to say that those who have so far failed to discover the exact nature of that name now have a chance to do so at the first TAGO Cheese & Wine Party here at Sheffield’s famed Magick Lounge on Thursday 26 August from 8.30 p.m. Please note that this is a ticket-only event. Your precious pass to a world of eclectic musical entertainment and a variety of enticing cheesy comestibles is available online only for a mere £4 from this link (click here). So, all you Sheffield sophisticates and uke-loving hep-cats, just leave your worries on the doorstep on the sunny side of Broad Street. It’ll be magic.